Security and network performance tools are unable to or weren’t built to handle and analyze traffic at higher bandwidths. 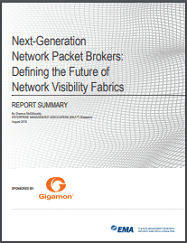 Read Enterprise Management Associates new research report, “Next Generation Network Packet Brokers: Defining the Future of Network Visibility Fabrics” to learn how to reduce unnecessary tool upgrades due to bandwidth increases — resulting in decreased costs, improved tool utilization and optimized investments in existing networking and security tools. Learn more by downloading this report!